It's still revoltingly rainy here in Auckland and our basement is more than a little damp. My sewing room is in the basement so my Creative Space is in the kitchen today. I'll be wearing a lovely ensemble of thick wooly socks and extra long cardigans and trying not to cut any of them as I crawl around on the floor cutting out patterns and fabric. Know the feeling? I have some little red shorts to make for my Dolly Donations soccer player. If you can spare the time to make a dolly, please do. It's a great cause. All the info can be found via the link above. All you lovely ladies who can crochet and knit can join in too. There are free pattern's on the Dolly Donations blog to make knitted and crochet dolls. The deadline isn't until 1st November so there is plenty of time for you to get creative! I've been doing some more knitting myself. The green sweater has been put on hold briefly while I make a warm ballet cardigan for Maddy. Mum is going to make Eloise's for her which is a very good thing. I hate making the same pattern twice (my knitting bag is full of single socks and booties). Do you have that problem too? Cut out three or four 2 inch wide strips about 1 1/2 times the length you want them. Set your machine to the longest stitch length and stitch down the middle of each strip. 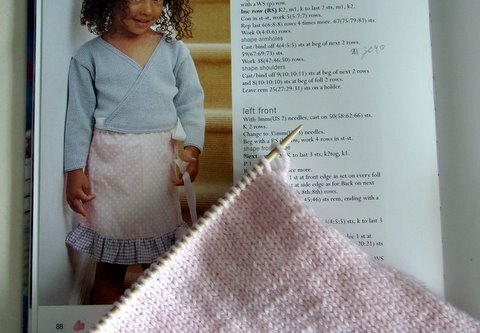 Carefully pull one of the threads to gather your piece to the length you want it. 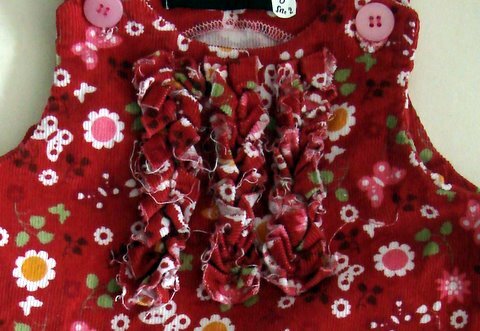 Pin all the pieces to the front of the outfit you are decorating (I used a pin at the top and the bottom and one in the middle to secure it). Stitch down each strip (remembering to adjust your machine back to the normal stitch length), removing the pins as you go. Back stitch at either end to make sure the strips are secure. If you use knit fabrics, the strips won't fray. You could do something similar with wide grosgrain ribbon. Let me know if you do this as I'd love to see what you make. Your dolly donation is fabulous! Soccer Dolly is adorable! I will make sure to check out the link too. It does sound like me, sometimes it seems I only vacuum so I can lay fabric on the floor! Yes, I hate making the same thing twice. I think that's probably the main reason I've pulled out of selling my clothes to shops this year. I love your little doll and his outfit. Love the soccer playing dolly! Love the pinafore, so cute! I also find it hard to knit two of the same things. I always do two at once now so I don't have the problem. I really love the fabric and the gathering on your dress, its so pretty. And thanks for sharing the dolly donation link, what a great thing to be involved in! Don't let the rain get you down, not long now til you can soak up some qld sun! I love that style of cardi - it'll last her for ages! Thanks so much for making a dolly! I adore your pinafore dress, the ruffles are so sweet! 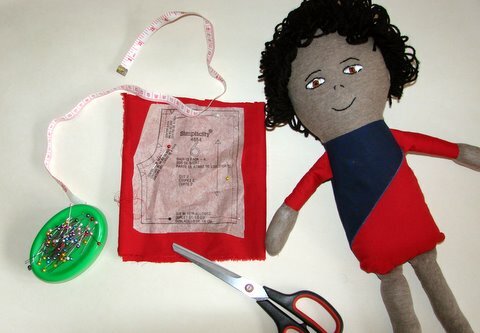 The doll looks great, and so does the pinny. I love the idea of ruffles on a tshirt. second sock syndrome is rife in this house too! Oh the little frillys on the pinny are sweet. The cardigan pattern looks lovely and your doll is too cute! Gosh you have been keeping busy. 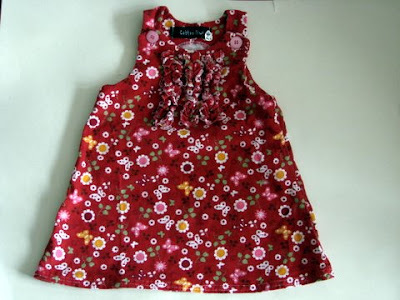 Love the ruffles, will have to try that on the next thing I make for one of the girls. Thanks for the dolly donation link- will definitely look into it. Love all your creative happenings! xo m.
I love your soccer doll! you sound as glamorous as me when I'm crafting ... in my thick wool socks and nasty old track suit pants. your crafting looks really good, the dolls are so sweet. Your little dolly is super cute and the little dress with the extra detail......gorgeous! The dolly is gorgeous as is the ballet wrap cardigan, how soft and girly lovely does that look! I'm also loving the dress, how busy you have been, a great creative space.